Nor shall you post or transmit through the Site any information or material which encourages conduct that would constitute a criminal offense, give rise to liability or otherwise violate any law or administrative ruling or guidelines, is in violation of these Terms, or which, without Middle Park Health’s prior written approval, contain advertising or any solicitation with respect to products or services. Any conduct by you that, in Middle Park Health’s opinion, restricts or inhibits any other user from using or enjoying the Site will not be permitted. The Site contains information and material, including, but not limited to, text, software, photos, video, graphics and audio, (collectively “Materials”) which are derived in whole or in part from information and materials supplied by Middle Park Health and other sources, and are protected by international copyright, trademark and other laws and the entire content of the Site is copyrighted as a collective work under the United States Copyright Laws. 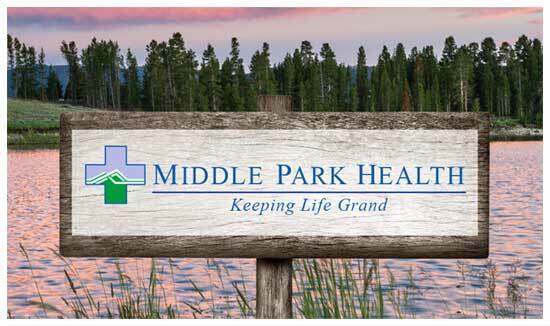 Middle Park Health owns the copyright in the overall selection, coordination, arrangement and enhancement of such content, and owns the rights in, or license to use, the individual components of such content. Materials may not be copied, reproduced, republished, modified, uploaded, posted, transmitted or distributed in any way or decompiled, reverse engineered or disassembled, including but not limited to the text, images, audio and/or video, as well as any software (including but not limited to any images or files incorporated in or generated by the software or data accompanying such software), except that you may download one copy of the Materials on any single computer for your personal, non-commercial use only, provided you keep intact all copyright, trademark and other proprietary notices and make no change in or deletion of author attribution. This limited authorization is not a transfer of title in the Materials and by your use of the Site, you acknowledge that you do not acquire any license, ownership or other rights to the Materials. Modification of the Materials or use of the Materials for any other purpose is a violation of Middle Park Health’s or such other sources’ copyright, trademark and other proprietary rights and may violate other laws. The use of any such Materials on any other Web site or networked computer or environment is prohibited without Middle Park Health’s express written consent. If you breach any of these Terms, your authorization to use the Site automatically terminates and you must immediately destroy any downloaded or printed Materials. The site and materials and related communications are provided “as is” without any representations or warranties, express or implied, of any kind, including, but not limited to, warranties of merchantability, non-infringement, or fitness for particular purpose. Some jurisdictions do not allow for the exclusion of implied warranties, so the above exclusions of implied warranties may not be applicable under certain circumstances. Under these circumstances, all other exclusions remain in force. P1P does not warrant the accuracy, reliability or completeness of any information contained on this site. Nor does it warrant or represent that any information may be suitable for use in any circumstance or application. By using this site you acknowledge that any reliance on any such materials, advice, statement or information shall be at your sole risk. Middle Park Health assumes no responsibility and shall not be liable for any damages of any nature caused by the use of this site. This express disclaimer includes damages caused by viruses, worms, trojans or any other computer software or anomaly that may infect, affect, or damage your computer hardware, software, memory or any other property of yours or others, as a result of your access to, use of, or browsing in this site. Middle Park Health may provide as a convenience to you, links to Web sites operated by other entities and persons, but makes no representations whatsoever about any other Web site which you may access through this one. Any link to a non-Middle Park Health Web site does not mean that Middle Park Health endorses or accepts any responsibility for the content, or the use of such Web site. If you use these sites, you do so at your own risk. Middle Park Health makes no warranty or representation regarding, and does not sponsor or endorse, any linked Web sites or the information or materials appearing thereon or any of products and services described thereon. Furthermore, links do not imply that Middle Park Health is affiliated or associated with, or that any linked site is authorized to use any trademark, trade name, logo, or copyright of Middle Park Health. Any opinions, statements, services, offers or other information or content expressed or made available in the Site by any third party are those of the respective author(s) or distributor(s) and not of Middle Park Health. Your use and browsing of the Site is at your risk. If you are dissatisfied with any of the Materials contained in the Site, or with any of these Terms, your sole and exclusive remedy is to discontinue accessing and using the Site. Under no circumstances will Middle Park Health, its suppliers or other third parties mentioned at, or involved in creating, producing, or delivering the site be liable for any direct, incidental, consequential, indirect, special or punitive damages whatsoever (including without limitation, costs and expenses of any type incurred, lost profits, lost data or programs, and business interruption) arising out of your access to, use, inability to use or the results of use of the site any Web sites linked to the site, or any materials contained at any or all such sites (including but not limited to those caused by or resulting from a failure of performance; error; omission; linking to other Web sites; interruption; deletion; defect; delay in operation or transmission; computer virus; communication line failure; or destruction, unauthorized access to, alteration of, or use of any computer or system), whether based on warranty, contract, tort, negligence, strict liability, or any other legal theory and whether or not Middle Park Health was advised of the possibility of such damages. Middle Park Health shall have no liability or responsibility for any acts, omissions, or conduct of any user or third party. Middle Park Health’s obligations and responsibilities regarding its products and services are governed solely by Middle Park Health’s terms and conditions of sale or license under which such products and services are sold or licensed. Copies of such terms and conditions are available from the applicable Middle Park Health entity. The Materials at the Site may contain various forward-looking statements and which may be based on or include assumptions, concerning Middle Park Health’s operations, future results and prospects. These forward-looking statements are based on current expectations and are subject to risk and uncertainties. In connection with the “Safe Harbor” provisions of the United States’ Private Securities Litigation Reform Act of 1995, Middle Park Health provides the following cautionary statement identifying important economic, political and technology factors which, among others, could cause the actual results or events to differ materially from those set forth or implied by the forward-looking statements and related assumptions. Such factors include, but are not limited to, the following: (1) changes in the current and future business environment, including interest rates and capital and consumer spending; (2) competitive factors and competitor responses to Middle Park Health’s initiatives; (3) successful development and market introductions of anticipated products; (4) changes in government laws and regulations, including taxes; (5) unstable governments and business conditions in emerging economies; (6) continuation of the favorable environment to make acquisitions, domestic and foreign, including regulatory requirements and market values of candidates. It has been and remains Middle Park Health’s policy not to accept or consider ideas, suggestions or materials other than those that Middle Park Health has specifically requested from you. Accordingly, Middle Park Health does not want you to, and you should not, send any confidential or proprietary information to Middle Park Health through the Site unless specifically requested by Middle Park Health. Please note that any unsolicited information or material sent to Middle Park Health will be deemed not to be confidential or proprietary. By submitting information and material to the Site, you automatically grant to Middle Park Health (or warrant that the owner of such information and material has expressly granted to DBA) a royalty-free, perpetual, irrevocable, unrestricted, right and license to use, reproduce, display, perform, modify, adapt, publish, translate, transmit and distribute, or otherwise make available to other such information and material (in whole or in part and for any purpose) worldwide and/or to incorporate it in other works in any form, media, or technology now known or hereafter developed. You also agree that Middle Park Health is free to use any ideas, concepts, know-how, or techniques that you send Middle Park Health for any purpose. As further provided above, Middle Park Health does not want to receive, and you are deemed to covenant and agree through the use of the Site not to provide, any information or materials to Middle Park Health that are defamatory, threatening, obscene, harassing, in violation of any law, governmental requirements or otherwise unlawful, or that incorporate the proprietary information or materials of another person or entity. You shall not upload, post or otherwise make available on the Site any information and material protected by copyright, trademark or other proprietary right without the express written permission of the owner of such right(s). You shall be solely liable for any damages resulting from any infringement of copyright, proprietary rights, or any other harm resulting from such a submission. Middle Park Health reserves the right, in its sole discretion, to revise these Terms at any time and correct any errors or omissions in any portion of the Site and Materials. Materials may also be changed, modified, added, or removed and updated without notice at any time; however, Middle Park Health is under no obligation to update Materials. Middle Park Health may also make changes in the products, services, programs, or prices (if any) described in the Site at any time without notice. Your continued use of the Site after any change Middle Park Health makes to the Site will be considered acceptance of those changes. Anyone linking to Middle Park Health’s Site must comply with Middle Park Health’s guidelines for linking to Middle Park Health’s Site and all applicable laws. You are hereby given permission to link to the root domain of the Site at http://middleparkhealth.org. You may not link directly to other pages, resources, media, images, or Materials without Middle Park Health’s express written permission. Doing so is a violation of applicable copyright law. The Site is administered by Middle Park Health from its offices in the United States of America. Materials published at the Site may refer to products, programs, or services that are not available in your country. Consult your local Middle Park Health business contact in this regard. Furthermore, Middle Park Health makes no representation that the Materials at the Site are appropriate or available for use at other locations outside of the United States and access to them from territories where their contents are illegal is prohibited. You may not use the Site or export information and materials in violation of the export laws of the United States or any other country. If you access the Site from a location outside of the United States, you are responsible for compliance with all applicable laws. These Terms shall be governed by the laws of the State of Colorado, without giving effect to any principles of conflicts of law. If any provision of this Agreement and Terms shall be unlawful, void, or for any reason unenforceable then that provision shall be severable from these Terms and shall not affect the validity and enforceability of any remaining provisions. These Terms constitute the entire agreement between Middle Park Health and you with respect to your use of the Site. Any cause of action you may have with respect to your use of the Site must be commenced within six (6) months after the claim or cause of action arises.